He's a visionary, some say, but not even Bob Dylan would have imagined that a single concert from 26 years ago could become so famous and so classic that it would not only wind up on film, but also have a second premiere in 2002. That's what has happened with "The Last Waltz," the 1978 rock documentary directed by Martin Scorsese about the last concert of the Band, back in 1976. The soundtrack has been remixed by Robbie Robertson, the Band's lead songwriter and guitarist, who is now a creative adviser for DreamWorks Records. And the movie's been re-released, with a limited theatrical run in ten cities, followed by a CD this month and a DVD next month. 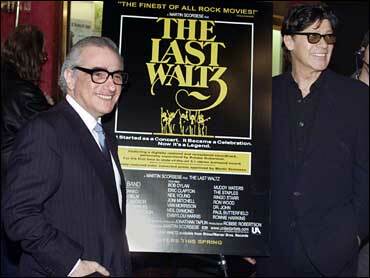 Wednesday night, heavy-hitters at the New York premiere of the reborn "Last Waltz" at the storied Ziegfield Theater included Michael Stipe of REM, fellow musician Dr. John, Microsoft co-founder Paul Allen, actors Kevin Bacon, Kyra Sedgwick and Rosamund Pike, and of course, Scorsese and Robertson. There are reasons why "The Last Waltz" can still capture an audience. Unique moments such as Van Morrison high-kicking in the air, Neil Young staring awe-struck at Bob Dylan, and Eric Clapton and Robertson locked in a guitar duel are among those which have put the film in a special place in rock and roll history. Robertson takes a larger view of the significance of the documentary. "The main job here is to pass the baton - pass this on to other generations," says Robertson of the project. Way back when, the idea of "The Last Waltz" started humbly enough. Members of the Band, known for such songs as "The Weight" and "The Night They Drove Old Dixie Down," besides backing Dylan in 1965-66 and 1974, decided to give a farewell concert on Nov. 25, 1976, at San Francisco's Winterland after 16 years on the road. To help them bow out, friends were invited to join them on stage. As the list grew to include the likes of Muddy Waters, Joni Mitchell, Dylan, Clapton, Morrison and Young, Robertson said he thought the event should be chronicled. The Band sought out director Martin Scorsese, who had helped work on director Michael Wadleigh's "Woodstock" seven years earlier.
" 'Woodstock' was about the crowd," says Robertson. "This movie's about the music. We are never, ever going to see these kind of people all together at one time again." The concert as envisioned by the Band, Scorsese and his crew, which included Hollywood production designer Boris Leven, had a dramatic flair unusual at that point in a rock film. The 38-piece Berkeley Promenade Orchestra provided background music during a turkey dinner for the 5,000 fans who paid $25 a piece to attend. Sets from the San Francisco Opera's "La Traviata" were rented as a stage backdrop. Three chandeliers designed for "Gone with the Wind" hung above the stage and several classical statues were borrowed from the prop department at 20th Century Fox. Rock promoter Bill Graham, who produced the show, referred to it as "rock and roll's last supper" in his autobiography. "It was stunning because we were used to the Winterland being a pretty sparse and funky arena once used for ice skating shows," said music journalist Ben Fong-Torres, who covered the concert for Rolling Stone. The crowd responded to the swanky surroundings, Fong-Torres said. "There were some tuxedos among the crowd," he said. "This was like prom night." The Band hit the stage shortly after 9 p.m., and the concert ended more than five hours later. The music included blues, folk, rock and country. "It's one of the pleasures of my life to be on the stage with these people," an almost giddy Young says at one point. One of the highlights is seeing Morrison, known as a mercurial and temperamental performer, end an emotional singing of "Caravan" by repeatedly kicking into the air. "He was just so exuberant. He just had a ball," Fong-Torres said. "And his outfit - it was almost like a circus outfit, like a trapeze artist." Dylan, in an outlandish feathered white fedora, closes the show by leading the reassembled guests in "I Shall Be Released." And interspersed throughout the film are interviews with members of the Band, talking about life on the road. After "The Last Waltz," the group never toured with Robertson again. Remaining members - pianist Richard Manuel, organist Garth Hudson, bassist Rick Danko and drummer Levon Helm - did regroup and tour together beginning in 1983. Three years later, Manuel hanged himself in a Winter Park, Fla., hotel room. In 1999, Danko died in his sleep, overweight and with an admitted drug habit. Robertson has no regrets about quitting the road when he did. "As far as what my instincts were telling me, it was a choice that needed to be made," Robertson said. "I always loved playing music with those guys. I always loved making records. But it just ran its course."